I’m in love with pasta. People look at me weird when I say that because I think people have this idea in their head that if you are gluten free, you don’t eat pasta. Umm…so not true. I love a good pasta dish and that’s exactly what this one is. Full of flavor and savory. This one comes from Pinch of Yum. I think everyone out there knows who Pinch of Yum is, but when I saw this recipe it had me hooked! I love pesto sauce. I love walnuts. I love mushrooms. Putting them all together just make sense! 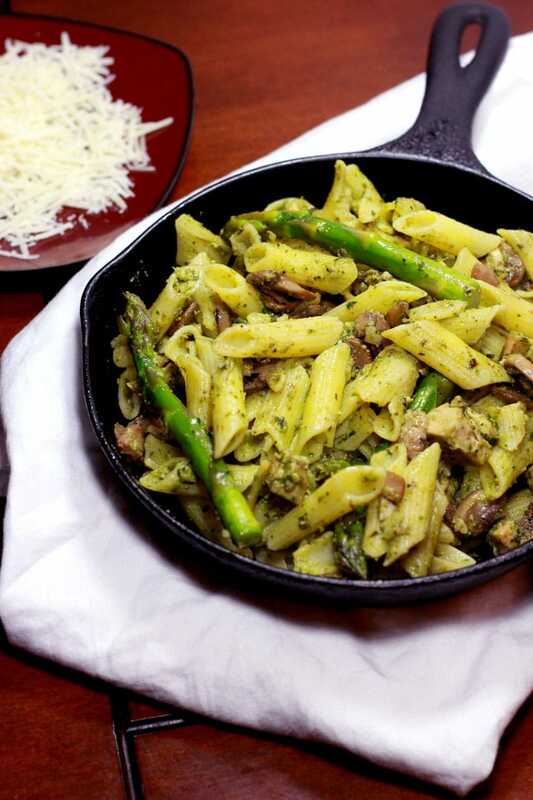 Oh – but I added some chicken and asparagus to this recipe. I have to have my vegetables and protein! I also love this dish because it fits all my macros perfectly. I’m a fitness freak and I use myfitness pal every single day to ensure I’m hitting my macros. It’s really important to me that I hit my protein, fat and carb macros daily. I primarily work out at night and when it’s my lower body push day, I need a meal like this to get me through it. It’s brutal. It’s a 1.5 hour workout that involves an insane amount volume/weights. I do a combination of hack squats, smith machine squats, weighted walking lunges, leg press and a couple more intense exercises. I hired a trainer and it was well worth it because I got the results I wanted. I dropped from 23% body fat to 13% body fat in about a year. I gained 11 pounds of muscle and lost 13 pounds of fat! Amazing results! And you know how I got there and how I maintain it? I ate and I lifted. I don’t diet…at all. I ate the right macros and I lifted weights. I get sick of eating…. that’s how much I have to eat. I typically eat six times a day. Ok, but back to this recipe…. I personally struggle to hit my fat macros on some days. My fat macro level is 71 grams of fat a day…but I burn it so it’s not that high of a number to me. This recipe is high in fat mostly because of the walnuts, olive oil and Parmesan. If you want to lighten this dish up a bit, cut out the Parmesan and lighten up on the olive oil. Don’t cut the walnuts. They contain your heart healthy fat and your omega-3 fatty acids and you need that kind of fat in your life. And yes – you can make this recipe either gluten free or traditional. What I mean by that is I use gluten free penne noodle. If you’re not gluten free, you can use regular noodles. Your choice! See – versatility! Ahhh…..look at this pasta! I’m so in love! I just want to eat this picture! It tastes that great! Enjoy this one. 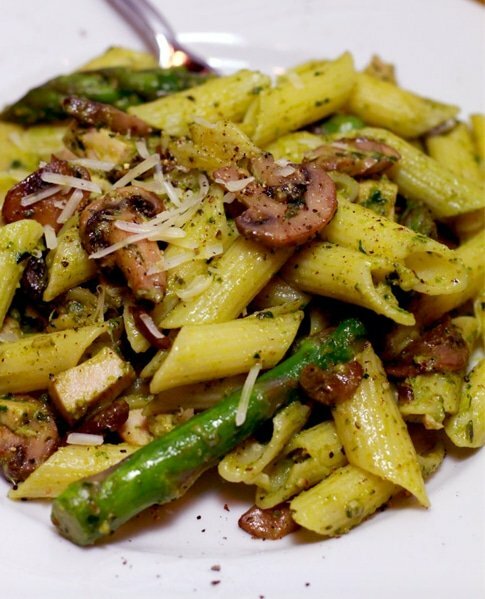 It will easily become one of your “go to” pasta dishes. I promise! Heat oven to 350 degrees. Season the thin sliced chicken breasts with salt and pepper. Cook in an oven safe dish for 30 minutes uncovered until done. Once the chicken is done, slice into thin strips. Set aside. 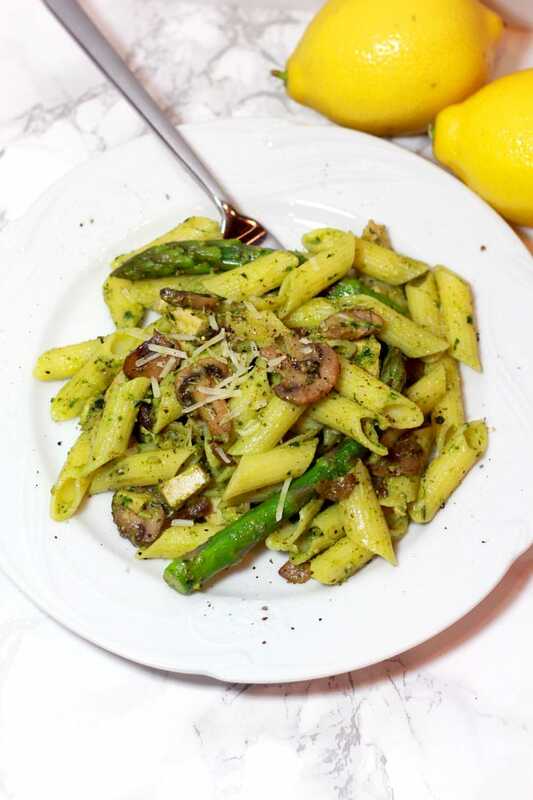 You will now want to blanch your asparagus. To blanch asparagus, add to a pan of boiling water. Cook for 2-4 minutes or until bright green. Run under cold water and set aside. While the chicken is cooking, cook the penne pasta according to package direction and drain. Rinse with cool water and set aside. Toast the walnuts in a small saute pan over low heat with no oil. You will want to stir/shake the pan until the walnuts are lightly toasted. This takes about 5 minutes and you’ll start to smell the nutty aroma. Once the walnuts are toasted, in a food processor or blender combine all the ingredients for the walnut pesto and puree until smooth. In a large saute pan, heat the Extra Virgin Olive Oil and add the mushrooms and saute for about 8 minutes. The consistency of your mushrooms should be a deep golden brown. 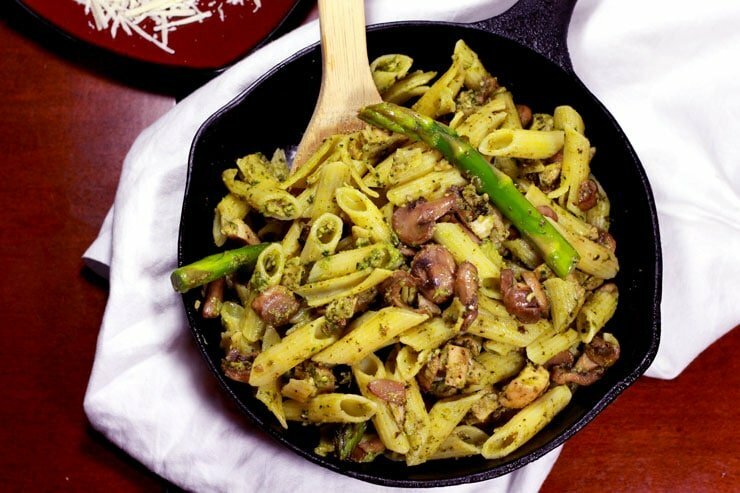 Add the cooked penne pasta, sliced cooked chicken breasts, asparagus and the walnut pesto sauce to the pan and stir to combine. Top with Parmesan cheese and parsley. Add salt and pepper to taste.